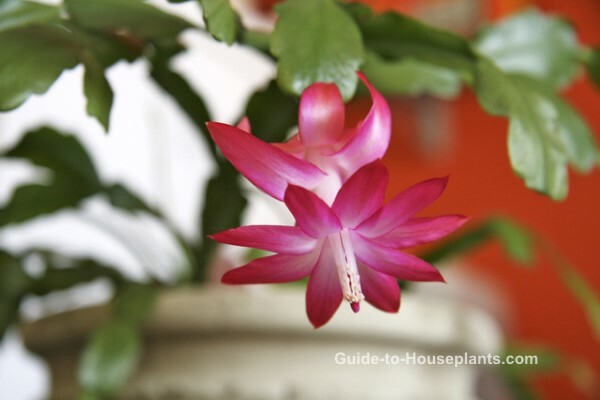 Good Christmas cactus care will ensure beautiful blooms in time for the holidays. Christmas Cactus is a stellar performer with gorgeous blooms in time for the holidays. 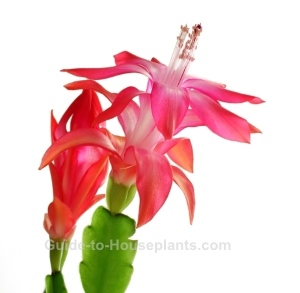 Schlumbergera bridgesii has dark-green flattened stems composed of segments joined in a scalloped pattern. Flowers appear at the tips of the stems and are available in shades of pink, red, purple, yellow, and white. More than 200 cultivars exist. 'Christmas Flame' is golden yellow...'Lavender Beauty' is purple and white...and snowy 'White Christmas' are just a few. With so many beautiful colors to choose from, why buy just one? Newer cultivars bring together two colors, offering some exciting new combinations. After your cactus is through flowering for the season, it needs about a one-month rest. Water sparingly and stop fertilizing until new growth begins in spring. Regular pruning will encourage the plant to branch out where the stem was cut, creating a fuller plant. Spring is the best time to prune it back, when it begins actively growing again. Pruning Tip: Use sharp, clean pruning shears to prevent tearing the stems. Cut a stem off between segments (the place where they're joined together by a midrib). Growing this plant is easy, but there are a few things you should do to make it bloom before the holidays. Shorter, cooler days and nights for about 8-10 weeks are needed for the plant to set buds. Moving it outdoors in fall is ideal, just keep it out of direct sun. Bring the plant back inside before the first frost. Keep soil barely moist, but not too dry. Shriveled, limp stems are a sign that it's too dry. Once it starts budding, keep the plant in the same location. Changes in light and temperature by moving it around will cause it to drop its buds and flowers. Also keep it away from drafty areas like doorways and heat vents. Repotting Christmas cactus plant is usually only necessary every 2 to 3 years. It prefers to be slightly pot-bound and blooms best this way. Wait till spring or early summer to repot -- never while it's blooming. Humidity: Try to maintain around 50% relative humidity. Stand the pot on a dish of wet pebbles. Check out these tips for raising the humidity. Soil: Well-drained potting medium is essential. Mix 1 part potting mix and 1 part fine-grade fir bark. Fertilizer: Feed every 2 weeks with a balanced liquid fertilizer diluted by half. After blooms have dropped, stop fertilizing for a month.